The indices have been grinding higher over the last two weeks, the stocks that took off initially (bio’s, small caps, financials) have slowed down a little over the last two days allowing the post-election losers to bounce a little, specifically FANG. 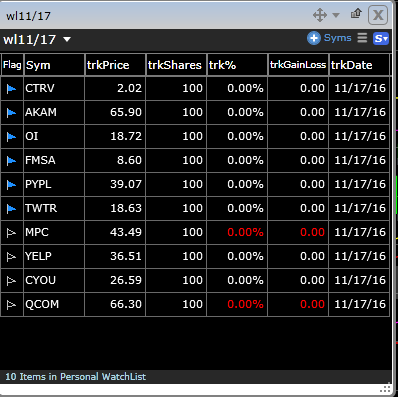 CTRV, AKAM, OI, FMSA, PYPL, TWTR, MPC, YELP , CYOU, QCOM, are the names on my long watchlist today. These stocks are actionable to me if and only if they go through yesterday’s high.